My son and I were on a recent visit to my hometown. My nephew Liam was eager to entertain his 2 year old cousin so he went on a treasure hunt around the house and found these toy-like objects -miniature vehicles that are almost too beautiful to play with. These miniature models became the inspiration of this week’s posts “Vehicools”. We look into vehicles that are ‘cool’ and ‘noteworthy’ because of how they came to be and what they have come to symbolize. 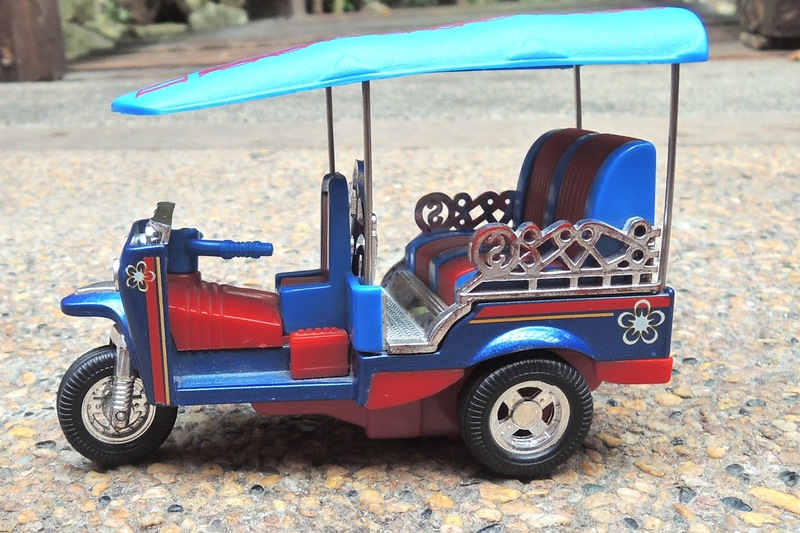 Today I feature Thailand’s TUK-TUK. 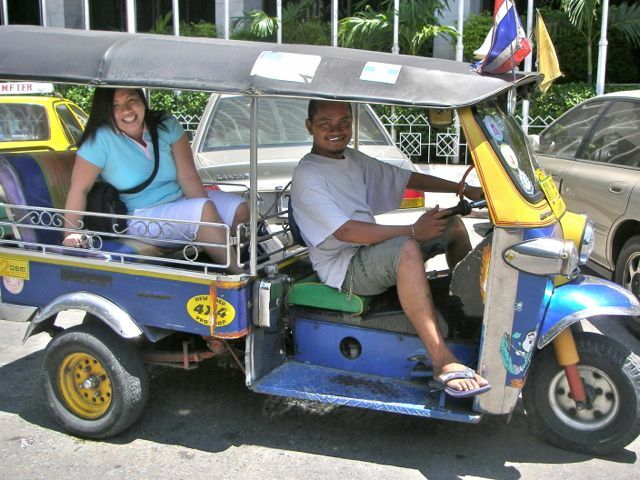 It’s unique, colourful, comfortable, and gets you around the busy streets of Bangkok. It’s just extremely loud, so for those who are noise-sensitive, make sure you wear ear plugs. (and if you are smoke and dust sensitive, wear a mask so your Tuk-tuk experience will be a pleasant one). Just ride prepared! It is also a symbol of Thai artistry. 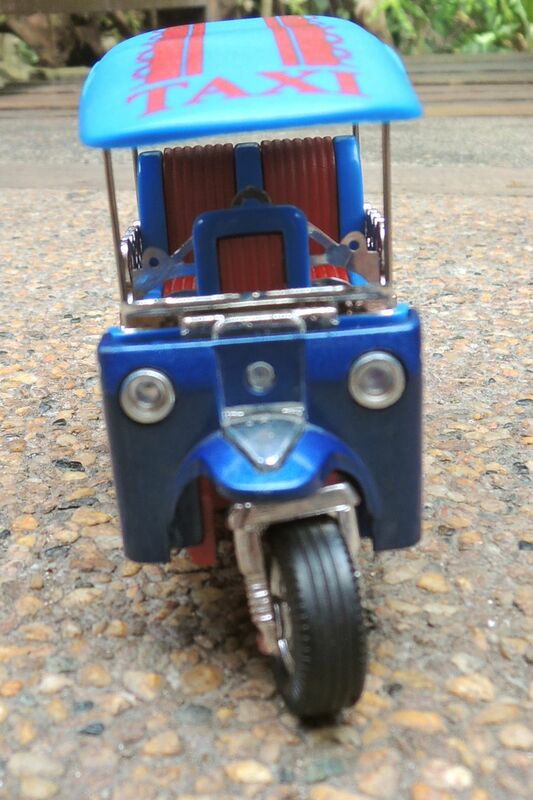 Although the make is similar, tuk-tuks are adorned and painted in many different ways and colours. The colourfull tuk-tuk has in fact become a tourist attraction in itself because of its novelty. Without any luggage, three people can fit into a tuk-tuk quite comfortably, It’s possible to fit more in but it gets a bit cramped. Tuk-tuk fares always have to be bargained for and it is sometimes possible to bargain down to less than the taxi flagfall of Bt35. Most of the time, however, they offer no savings over a taxi, especially if you’re not good at bargaining and can’t speak good Thai. The initial price tuk-tuk drivers quote is likely well over the going rate, but it’s easy to bargain it down to a more reasonable one if you roughly know the equivalent taxi fare. 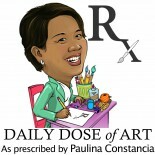 This entry was posted on June 3, 2012 by Paulina Constancia in Uncategorized.